Title: Belgium sev Germania Inferior. Publication: Geographiae universae tum veteris, tum novae absolutissimum opus... Auctore eodem Io. Anto. Magino Patavino..., Cologne 1597, Petrus Keschedt. A beautiful map of Belgium, Holland and Luxembourg orientated with north to the top right corner. 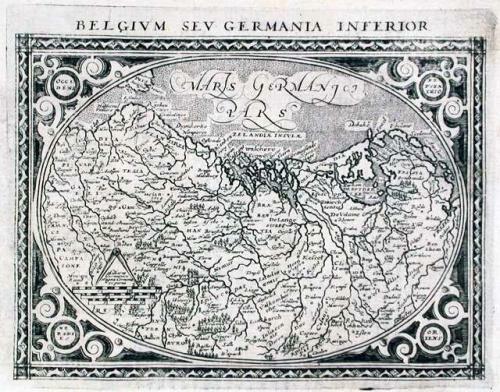 The unusual oval map is enclosed within a decorative border. Text on verso.